One of the great women in my lifetime was Maya Angelou, because of the words of wisdom she imparts to those who read her books, quotes and search out anything on Google.com about her. Her poetry and dedication to civil rights and uplifting others is a testament to the philosophy that you should make it your mission in life to brighten the day of those around you, because it is in you to do so. 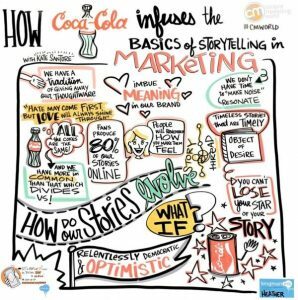 In the opening of the Content Marketing Institute video regarding Coca-Cola and storytelling (http://contentmarketinginstitute.com/2018/02/coca-cola-storytelling/?utm_source=zest.is&utm_medium=referral&utm_term=zst.5a82e18e807d4), Kate Santone quoted Maya Angelou and it resonates as something marketers should remember. Read that once, now again, and again. Can you think of either a commercial or print ad that makes you feel that way? What about a person, and not necessarily someone you know, who may have said something to you that when you heard the words, you felt them too? Martin Luther King, Jr. comes to my mind when I hear “I have a dream!”, and I feel the goose bumps on my arms and the tingle on the back of my neck. What is the first thought that comes to my mind when I hear that? That with confidence, faith and perseverance, all things are possible, and Martin Luther King, Jr. made me feel that. I consider that my Mantra, in life, and in my academic journey. Will it be easy? Probably not, but nothing in life should be easy, unless it is opening a pickle jar. But when we apply for a job, we would like to be all those things to a potential employer, and more. While it is said that we all have doppelgangers out in the world, they may look like us, but they do not think like us. We need to be the exception, and not the rule in life, our career and how people see us. I remember reading an article that asked if we see the glass as half-empty or half-full, and how the reply determined how well we would do in life, as explained by Wikipedia (https://www.google.com/search?q=glass+is+half+full&ie=utf-8&oe=utf-8). Perception of others is very important in our daily lives and how others view us in our academic journey is sometimes harsh. 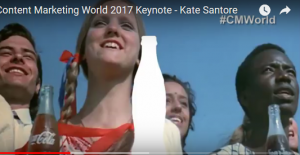 Coca-Cola’s Kate Santone mentioned that “We have more that connects us then divides us”, and we should all remember that. How boring it would be if we were all the same, day-in and day-out, in how we dress, in what we eat, and how we market ourselves. I am a first year student and I already know who I wish to emulate as a marketer and in my life, and who I prefer not to mimic in any way, shape or form. Am I correct and they are not? No, but I feel that we should represent ourselves as close to our true selves as possible. The Coca-Cola campaign, “I’d Like to Teach the World to Sing” truly defines the “represent ourselves as close to our true selves as possible” because we all want to live in peace. Another great example of this is “We are the World”, and all it represents in the way that we, as individuals, come together and form “ONE”. 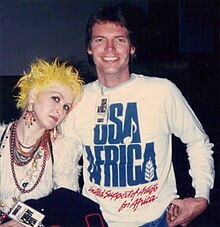 This 1985 song was created as a humanitarian effort to feed the poor in Africa, and lead the way for music artists to continue this type of effort even today. According to Wikipedia, (https://en.wikipedia.org/wiki/We_Are_the_World), this song is still relevant twenty-five years later. In researching Maya Angelou for this blog, I came across an article regarding the quote I used in my opening and how the business world is using that quote in their business. Carmine Gallo, author of “The Maya Angelou Quote That Will Radically Change Your Business”, (https://www.forbes.com/sites/carminegallo/2014/05/31/the-maya-angelou-quote-that-will-radically-improve-your-business/#39bd400118be), suggests that the quote may have influenced leaders who have in some small way followed this belief. who have turned businesses into customer service champions. Angelou to make their point. As with Coca-Cola, and the four arch types mentioned above, I am in complete agreement with the statement above, “Brands that excel in service focus on making people feel good about the relationship with the product, service or employees.” And we are the “Brand” that needs to excel. We can expand on this thought by making it about us, in our life, our career and how we want others to view us. We never get a chance to leave another first impression, so make the first one count. Do not act as others wish you to act, but as you wish to act. We may not come up with a quote that others will repeat long after we are gone, but we should leave them with the memory of how they felt when we said something (I hope it was something very profound! ), and how we made an impact in their life.